My gorgeous new website is live! You’ll find it at www.keligwyn.com. This is my final post on this blog site. In order to receive my posts, you’ll need to visit my stunning new site. Once there, click the blog link in the menu bar and subscribe using one of the options in the blog’s sidebar: email subscription or RSS feed. I’ll keep this blog up for a few months, but once I’ve gotten everything I need from it, I’ll delete the site. If you’ve linked to a post, you’ll need to update the link using the one for the post on my new site. Talented web designer Jason Walker of Website Ministries has been working hard creating my new website. I can’t wait to reveal the results of his artistry. The site is stunning! My blog is going to be combined with my website and will be accessed there soon. While Jason and I work behind the scenes to get everything neat and tidy before throwing open the doors to my new cyber home, I’m taking a blogging break. As soon as the site is ready, I’ll publish a final post here and invite you to pay me a visit at my new location. Until then, you can find information about me and my debut novel here. To learn more about A Bride Opens Shop in El Dorado, California, see the My Book page. The details about my fun-filled launch party and ice cream social happening on July 15th are on the Special Events page. The Victorians liked to pose for photographs. The early Daguerreotype came about in 1839, when the inventor Samuel Morse returned to the U.S. after visiting Daguerre in Paris. Ambrotypes and tintypes followed in the mid 1850s. The carte de visite came on the scene around 1859. This 2.5 x 4-inch photograph mounted on cardboard was affordable. When the Civil War tore families apart, many had photos taken so they could gaze upon their loved ones. 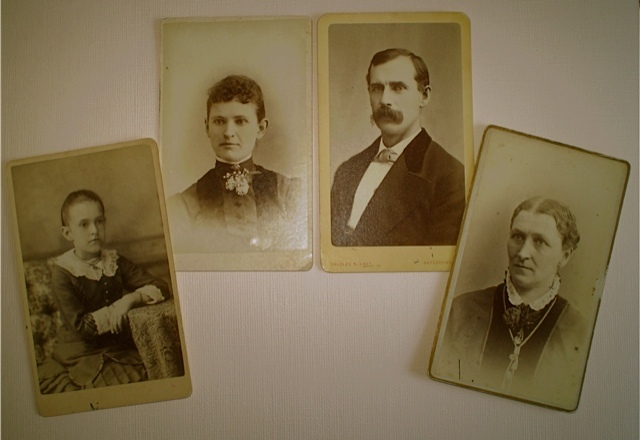 The photo above shows the four cartes de visite I found in an antique store and used as the models for the major characters in my debut novel. Although the photographs are over 140 years old, they are in remarkable shape, a tribute to the photography of yesteryear. 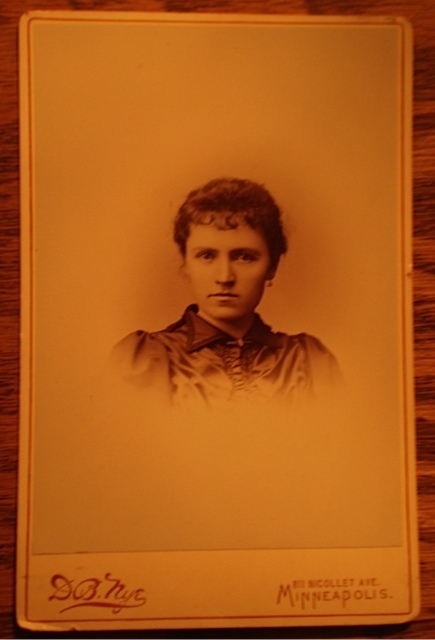 The carte de visite was replaced by a larger photograph in the 1870s. The 4 x 6-inch images were also mounted on cardboard. The one below shows the woman I used as the model for the heroine in my latest story. Can you guess what these larger photographs were called? You can leave your answers in a comment. If you want to see if you guessed correctly, click this link. You’ll need a password, but it’s an easy one. It’s Romance with a capital R.
I’m delighted to welcome romance writer Roxanne Sherwood Gray as my guest. We met online back in 2008, and I was impressed with what a sweet person she is. When we first connected, I learned that her life had undertaken an unexpected turn the year before, a sad one. In time the Lord blessed her with a wonderful surprise of the romantic kind. When I saw her at the ACFW Conference in September 2011, she was radiant. I’ve invited Roxanne to share her real-life romance with you. Prepared to be moved. My husband, Jack, and I were busy, home schooling parents of six. In our early forties, life was satisfying, but we wanted more. I dreamed of publishing a novel. With a master’s degree in engineering, Jack had spent his career in computer security and yearned for a Ph.D. in computer science. When I was pregnant with our seventh child, I urged Jack to pursue his Ph.D. I knew that if we waited for the right time—an empty nest?—to pursue our dreams, we’d wait forever. 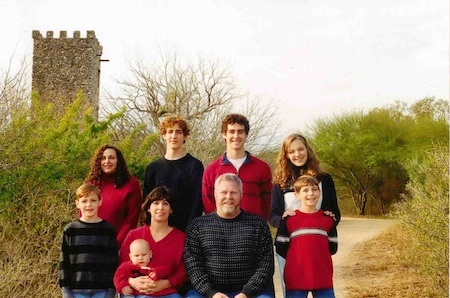 The Sherwood Family six months before Roxanne lost Jack. So I wrote about a widow with a second chance at love, while Jack took college classes. We celebrated contest wins and courses completed. He was my biggest fan. I was his most avid supporter. We were on our way. It was just a matter of time. Turns out, we didn’t have time. At least, Jack didn’t. In 2007, on our twin daughters’ 17th birthday, Jack suffered a fatal heart attack on the way home from work. He left me with seven children—ages 1, 8, 10, 17, 17, 18 and 20—all living at home. I had to remember to breathe. Did you notice the premise of my work-in-progress? A widow must decide if love is Worth the Risk. My heroine’s young son was named Peter. So was my youngest. She worried that her boys wouldn’t remember their father. My Peter was too young to remember Jack. It was surreal to be living my novel. I’d written a heart-wrenching scene where Stephanie, my heroine, is forced to take off her wedding ring. I’d built up the tension, so it was a really big deal for her. One day, I decided to date and quietly slipped off my wedding ring—I’d already worked through my emotions writing that scene. I don’t know if this novel will ever be published. Maybe I was the one who needed to read it. When I heard that high school classmate Steve Gray’s wife had died after a long illness, I sent him my condolences. He had no plans to remarry—and risk loving—again. I only wanted a friendship with him because he lived 1,200 miles away—and I’d known him since 5th grade. If we were intended to have a relationship, wouldn’t it have happened when we were young? Steve and I began emailing and chatting. After several weeks, he finally called. God made us attracted to one another’s voices. We talked for two and three hours a night for months, revealing the depths of our hearts as God knit our souls together. 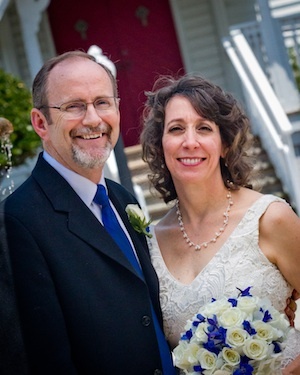 Steve & Roxanne on their wedding day–June 18, 2011. In some ways, pursuing a relationship was a risk. 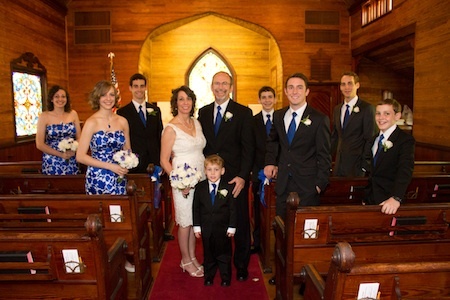 When we married in June 2011, we’d spent only 30 days together, usually 3-6 days at a time. We never dated, instead spending time discovering if we could be a family. Two hearts united. Two families combined. My children liked Steve immediately, but the four in college stayed in Texas when I moved to Florida to be married. Still, I knew God had handpicked Steve for me—and my three young sons. 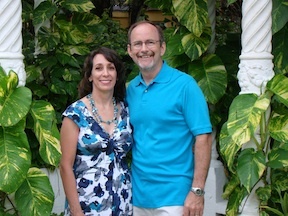 Roxanne and Steve on their honeymoon in Antigua. People ask when I’ll publish our story. For now, I’m still a novelist—with a new, fabulously supportive husband, who makes me laugh every day. He also says the most romantic things, and I’m tempted to stop and write them down for my hero to say. Instead, I enjoy the moment—and just hope I remember the words later. As for my decision to marry Steve? Worth the Risk! I’m honored to feature Amber Perry. I recently discovered her blog, the Historical Christian Romance Review, and am impressed by her reviews, her support of historical romance authors, and her appreciation of the faith element in the books she reads. Amber earned a BA in Liberal Arts from Portland State University. She’s a performer and voice teacher. She and her busy family live in Washington State. Amber describes herself as a “happy-go-lucky homemaker with a passion for historical Christian romance.” If she’s not feeding her baby or coloring with her three-year-old, she’s reading. Her biggest concern each day is making sure everything she does is for the glory of God. She loves the Lord and is grateful to be a member of The Church of Jesus Christ of Latter-Day Saints. The thing she loves most about the inspirational historical romances she reads is that they help her draw closer to the Lord. I asked Amber three questions about her reading and review process. After that, you’re in for a treat, because you get to learn three fun things about the woman behind the reviews. What led you to start reviewing books on your blog? When did you post your first review? 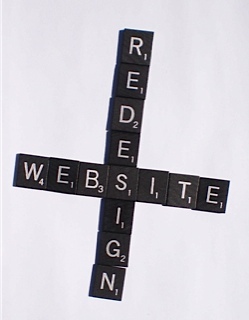 What can your visitors expect in the future? As you will notice from my site, I just started blogging a few months ago! I discovered this genre of books last year, and from then on I could not get enough! I kept talking about the books I was reading to my friends and family—how I felt about the stories, the author’s styles of writing, etc. They enthusiastically encouraged me to blog. I’m not sure if their motivation in suggesting it was so I would stop bugging them, (teehee!) but either way I am glad I started! I know I have only a small number of titles reviewed right now, (considering that there are MANY historical Christian romances out there!) but believe me I will be reviewing books as long as the authors keep writing! I like to do at least one or two reviews a week, which is about all I can manage with my other “mommy chores,” as I like to call them. It’s a personal goal of mine to read every HCR (historical Christian romance) out there, so I hope that my blog will grow over time and that people really enjoy it! I will be starting an “author of the month” section on my blog next month, which will include a book give-away. Those who “follow” my blog will be instantly entered to win! Yay! 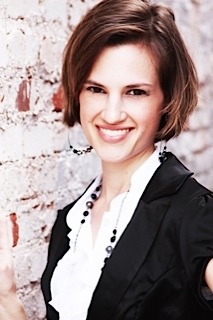 Keli will be the featured author in October, so be sure to check back then! It’s gonna be fun! If there’s an aspect of a story you don’t care for, you address it head-on but with thoughtfulness. How do you balance a reader’s desire for an honest review with your heart for the author of the work? I have so much respect for authors! It takes a great deal of hard work, sweat and tears to get something published, so I have a hard time being too critical of someone’s work. Also, I think that a lot of what I feel as a reviewer/reader is personal preference. I try to focus on what I enjoyed and just touch briefly on the things that didn’t appeal to me, etc. I feel like it’s also important that my readers get a clear idea of when they can expect from the book, but I always want to be respectful of the authors. When and where do you do most of your reading? I do most of my reading when my kids are sleeping! It’s really the only quiet time I have, so I make the most of it. When my kids take their naps, I like to pop onto my stationary bike and workout while I read…it helps to make the workout less tedious! Teehee Or, after I have done all my “mommy chores” and everyone is sleeping soundly, I like to get “snuggly” in my reading corner and read until I can’t keep my eyes open any more! Since you love historical romance, I have a hunch you’re interested in history. What three historical sites have you most enjoyed visiting? Ooooo! Fun question!!! I do LOVE history, that’s for sure. Many years ago I visited Gettysburg and it was life-changing for me. It’s so humbling to think of what those people suffered and ultimately sacrificed for our country! I hope to go back some day. Another one of my favorite historical places is Williamsburg, VA! Man, oh man, oh man! I felt like I had died and gone to Colonial heaven! It was like I had stepped back in time—I would go there again every year if I could! I can never read too many cowboy stories! While I lived in Oklahoma City, I enjoyed the National Cowboy and Western Heritage Museum (not really a historic site, I know, but I had to mention it! Hope that’s OK!) It was SO much fun for me, and I think that’s where I really started to work-up a “hankerin’” for all things Western! Since you say on your blog that you dreamed of being a homemaker, I’m guessing you love to cook. Am I right? If so, what are your signature dishes? If not, which take out food could your husband bring home that would make you the happiest? Heeheehee! Well, yes, I have always wanted to be a homemaker and I love my job like none other! But, one of the areas I have less natural ability, (eh-hem) is in the kitchen. I am getting better though, and my hubby is a very good cook, so I like to learn from him. But if he were going to pick something up for us it would be Thai food! Yum! Since you’re a young mom, I’m sure you’ve watched your fair share of children’s movies. Which Disney princess is your favorite, and which Disney villain do you most like disliking? Wow, it’s like you have visited our house or something! With two little girls you know we watch our share of Disney! I think my favorite is Rapunzel. I love her sweetness, her tenacity, and her strength. My favorite villain? Oh boy, I think I would have to say Lady Tremaine from Cinderella. She is pure evil! So readers, I am curious what it is that you look for in a review? Also, do you think that it’s important for my “site” to be on FB and Twitter too, because currently it’s not? Let me know your feelings! To get in touch with Amber, email her at historicalchristianreview (at) gmail.com. The Victorians were quite romantic. Every etiquette book written in the period that I’ve seen includes a chapter on writing love letters, for example. Love letters, however, were only one way young Victorians conveyed romantic messages, which could be difficult to deliver in person due to the ever-present chaperones. Couples used other means to express their feelings, such as flowers, calling cards, and gifts. Only when a couple was officially courting could a gentleman offer his ladylove jewelry. One item he might have given her was a ring, perhaps a very special kind of ring, one that oozed romance. These rings spelled out words using the first letter of each gemstone. The most popular ring of this kind was the Regard Ring pictured above, a replica sold by The London Victorian Ring Co. Can you name the five different gemstones used to spell R-E-G-A-R-D? Note that the stone used for the R’s was the same type. Another ring given by gentleman to their ladies to express their love, although not as often as the Regard Ring, was a Dearest Ring. Using the picture of the ring above, sold by the same company, can you give the name of the six stones used to spell D-E-A-R-E-S-T? Note that the type of gemstone used for the two E’s was the same. Since four of the stones are also used in the Regard Ring, you only need to come up with two new ones. Having lived in Germany in the early 90s when our U.S. troops were sent to the first Gulf War, I witnessed some tearful partings. That was the first time U.S. military personnel stationed in a foreign country were deployed, leaving their families behind without the usual support of relatives and stateside friends. The Army post in the town of Fürth, where Gwynly’s high school was located, was a sad and lonely place for many months. But then came the reunions. And were they ever joyful. We tied yellow ribbons on the house we shared with a dear solider friend who lived above us to welcome him home. To this day, I get teary-eyed when I watch news footage of troops returning home and see husbands and wives together again after the tense months or years of separation. Gwynly and I haven’t spent much time apart during our twenty-four years of marriage. The longest stretch occurred many years ago when he went to Europe on a short-term mission trip with our church and was gone three weeks. When we are separated, I miss him like crazy. I’ve been spending a couple of days with my parents, who both live out-of-town. While I looked forward to seeing them, I’ll be eager to get home to my guy. I doubt ours will be a tearful reunion–tears of joy that is, which I’m known to shed quite easily. After all, we only spent one night apart. I am looking forward to a great big hug, though. Every now and then being separated can serve to intensify feelings of love and make getting back together again that much sweeter. Such reunions are definitely romantic. What’s the longest amount of time you and your special someone have been separated? Have you witnessed some reunions of couples long separated that really moved you?